Now extended through March 20! “a theatrical event not to be missed! At the tail end of the Vietnam War veteran Beau Willie Brown attempts to return to the family and life he left behind. Inspired by and including extracts from For Colored Girls Who Have Considered Suicide When The Rainbow Is Enufby Ntozake Shange, but i cd only whisper explores the effects of trauma, moving through time and space, fusing the physical and the poetic. 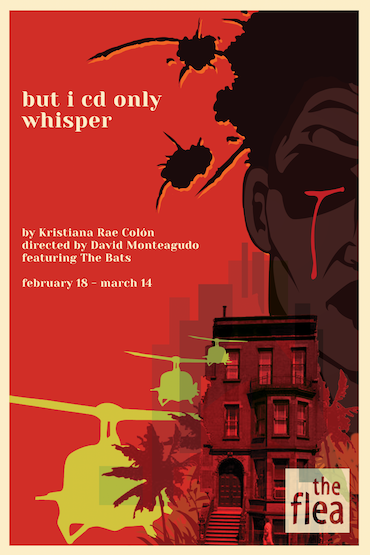 The American Premiere of but i cd only whisperwill be directed by Flea Resident Director David Monteagudo and features The Bats: Crystal Arnette (#serials@theflea, Mary Kate Olsen is in Love), Akeem Baisden Folkes, Toussaint Jeanlouis, Kineta Kunutu (#serials@theflea), Brandon Rubin, Matt Stango (#serials@theflea, The Mysteries), with understudies Clea DeCrane, Jack Gilbert, Justin Phillips, Rodrikus Springfield, and Terralon Walker. The creative team includes Starlet Jacobs (scenic design), Elaine Wong (lighting design), Ari Fulton (costume design), D.R. Baker (sound design), Michelle Cole (choreography), Gerry Rodriguez (fight choreography), Hye Young Chyun (props master), Joseph Barnes (technical direction), Michal V. Mendelson (production manager), and Kaila Hill (stage management). Kristiana Rae Colón (playwright) is a poet, playwright, actor, educator, Cave Canem Fellow, and Executive Director of the #LetUsBreathe Collective. Her play Octagon, winner of Arizona Theater Company’s 2014 National Latino Playwriting Award and Polarity Ensemble Theater’s Dionysos Festival of New Work, had its world premiere at the Arcola Theater in London in September 2015. Her work was featured in Victory Gardens’ 2014 Ignition Festival. In 2013, she toured the UK with her collection of poems promised instruments published by Northwestern University Press. In autumn 2012, she opened her one-woman show Cry Wolf at Teatro Luna in Chicago while her play but i cd only whisper had its world premiere at the Arcola Theater in London. Kristiana is a member of the Goodman Playwrights Unit, a Resident Playwright at Chicago Dramatists and one half of the brother/sister hip-hop duo April Fools. She appeared on Season 5 of HBO’s Def Poetry Jam. David Monteagudo (director) is a Brooklyn-based director and producer. He has developed and produced work with The Flea, The Atlantic, Theater for the New City, and Ma-Yi Theaters amongst others. His project Under the Hood, which melds game theory and theatrical conventions, was featured in the 2014 Come out and Play Festival and will be presented as part of The Best Games Festival in Pittsburgh. He is a founding member of State of Play.